Last week the look of the 2016 Mazda Miata was revealed for the first time, and that was it. We have absolutely no idea of most of the specs. 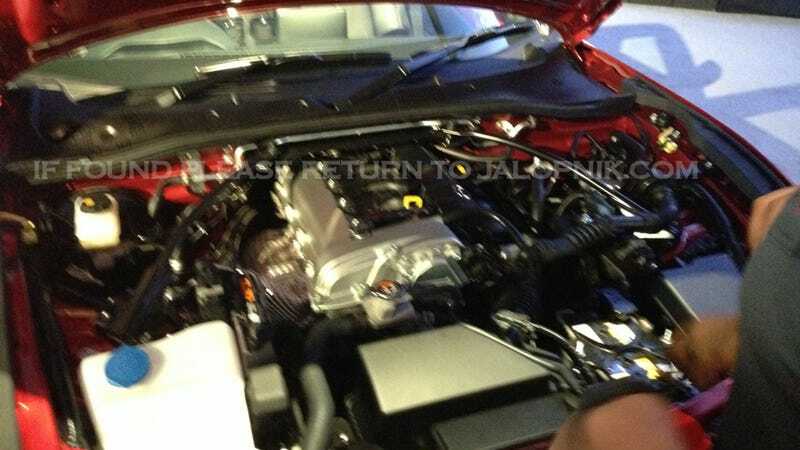 However, we do have this, the first look at the engine of the new Miata. Last week at Miatas at Mazda Raceway, Mazda employees were understandably tight lipped and secretive about any and ever spec of the new Miata. But then, inexplicably, at the end of one day, three folks went to pop the hood. Understandably, my interest was piqued, I ran over, got this shot, and then the hood was closed. Unfortunately, the Miata's engine doesn't have any specs just written on it, so there is precious little that we can tell. But here's what we do know. First, there is one thing written on the engine, and it's SkyActiv. We already knew would be the case. The sound of the car when it drove by us at the event was rather quiet, much like the 2.0 liter in the Mazda3. It was also definitely not turbocharged. On the bottom right, you'll notice that the battery remains in the front like the last generation of the car, not in the trunk like earlier cars. The engine is mounted incredibly low and far back in the chassis, which should make for excellent weight distribution. Other than that, there isn't that much we can tell. Still, it's good to know that the Miata actually has an engine. That's a step in the right direction.